Apache Roller 5.0 Release Candidate RC2 is now available for testing. I'm running RC2 on this site and it seems to be holding up just fine so far. Here's something I've been closely involved with during my entire IBM career (almost 9 months now): making software development more social by integrating Rational Team Concert and Lotus Connections. In case you don't know, Team Concert is Rational's "complete agile collaborative development environment" with integrated source code control, issue tracking, build management and very slick Eclipse and web-based client UIs -- it's a collaborative environment for software developers. 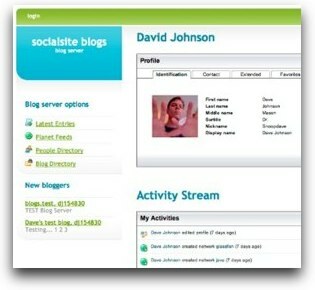 Lotus Connections is IBM's comprehensive social software suite with blogs (Roller based! ), wikis, social bookmarking, forums, file sharing, social networking and more -- an environment for more general collaboration. IBM partner Mainsoft has developed an integration between Team Concert and Connections and it's now available as a tech preview. The product makes it easy for developers to hook a a software development project up to a Lotus Connections and enable software developers to collaborate with the much wider community of folks involved with a software project including end users, subject matter experts, executives and other stakeholders. As you can see from the list of features, it's a pretty tight integration. If you want to learn more about the integration, check out the links I referenced above. There's also a short podcast available at Developer Works and there will be sessions at Lotusphere 2010 this month and (with luck) at Rational's Innovate 2010 Conference in June. It's been a while since I have blogged about it, but I haven't completely stopped working on Roller. In case you're wondering what's up in Roller-land, here's an update based on an email I recently sent to the Roller dev mailing list. I've been doing some weekend and evening work on Roller 5.0 to get it ready for release. Ganesh and Tanuja did great work on the new Media Blogging features, but there were a couple of significant pieces missing such as data migration and I18N. I had hoped to finish that work during the summer, but life got in the way. Now I'm scrambling to wrap things up. I'll be speaking at ApacheCon US 2009 in November on the topic of What's New in Roller 5.0, so I'd really like to have a 5.0 release candidate ready by then. Except for Media Blogging, all of those features are complete. My plan is this. I'll do some more cleanup work on Media Blogging, which is the major new feature in 5.0, fix some bugs and then I'll cut an RC. Ganesh Mathrubootham has been doing great work on the Media Blogging for Roller project and helping out in other ways in Roller development and support. So in January we nominated and voted him in as Roller's newest committer. Welcome Ganesh, we're very happy to have you on the team. I've really enjoyed working with Ganesh and his project partner Tanuja over the past six months, so this is great news. I'll tell you a bit more about the Media Blogging for Roller project in one of my next blog posts. New next-previous macro: this one is useful for showing a reader where they are in a blog, which post they are reading and the names of the next and previous posts; sorta like the "current location" sidebar in Greg Reimer's theme. Related entries: this is designed for use on an individual entry page and shows entries that are related to the entry being viewed based on tag and category relationships. This is an especially good hack because the code is a little scary; it iterates through the most recent 1000 posts in the entry's category, then the most recent 1000 entries in any category and then it does some analysis. I suspect this gives blogs.sun.com a bit of a workout, but it's serving four million hits/day at 97% idle so that should be no problem, no? Archive macro: this one shows a blogger.com-like list of links to recent month's entries. Would be a little nicer if it displayed a count of entries for each month, but I don't think that's possible with Roller's current template system and models. Nice stuff. Have you got any Roller hacks to share? Believe it or not, I've never created an XHTML theme for Roller and I didn't even notice the XHTML declaration when I put my new theme (which I'm calling Fauxcoly) together. I did notice when I got over 400 validation errors from the HTML validator. So, I worked for a couple of hours last night to fix the errors both in my new theme and in my most recent weblog entries. I also had to fix a couple of Roller bugs, which need to be reported. Now the main pages of my blog validate and I'm brave enough to put this in the theme's footer. Having a theme that supports XHTML isn't enough, of course. You also have to ensure that each blog entry is well formed and comments too. Unfortunately, we don't have great infrastructure for that in Roller (yet). I still plan to release the theme in packaged-theme form, but only after I XHTML-ize it too.